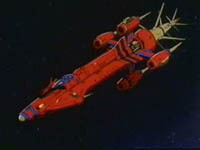 GP15A-II was the original name for the Outlaw Star, one of the most advanced ships in the galaxy that eventually fell into the hands of Gene Starwind. The ship itself was created during a highly secretive partnership between certain Pirate and Security forces in order to build advanced technology, including the XGP. The ship combines the combat capabilities of Pirate ships with the sleek design and standardized systems of Security ships. The computer mind of the ship is known as "Gilliam", which is also the name of small robots that perform maintenance on the vessel. A unique feature to the XGP is the fact that it makes use of Melfina, a bio-android to run the ship's navigation. Melfina places herself inside a large glass tube filled with special liquid, this liquid somehow enables her to make a direct "mental" connection with the ship. This allows her to share vital information with the ship at a much faster rate than could normally be achieved through normal means. Melfina's programming also includes special programming regarding information about the Galactic Leyline, but nobody other than the original programmers and the Leyline itself can access it. Gwen Khan was one of the original scientists who built the XGP and Melfina, and he once used a special command prompt to deactivate the bio-android. Before the ship could be fully tested the infamous pirate Hilda stole the ship. Hilda considered the ship to be a way of receiving long overdue reimbursements for work she had done for both parties. When Hilda was killed while stealing the XGP near Farfala it fell into the hands of Gene Starwind and his small crew of adventurers. Starwind renamed the ship "The Outlaw Star" in honor of Hilda, the outlaw who had befriended him. The Kei pirates sent the assassin group "The Anten Seven" to recover the Outlaw Star and Melfina, but each attempt was unsuccessful. After Gene Starwind, Melfina and the rest of the Outlaw Star crew reached the Galactic Leyline Melfina's programming regarding the Leyline was deleted. El Dorado is the name of the McDougalls personal ship, and it has a reputation of being one of the most dangerous ships in the galaxy. It features four grappler arms, an idea by the McDougalls who felt it would give them an advantage in combat over ships with two grappler arms. The ship is very fast and has won several different space races over the years. While it does not have the huge amount of missiles that other ships do, it can be outfitted with the Halcyon missile, which is one of the most powerful missiles available. The best-kept secret about the El Dorado is that there have been multiple copies of the ship built. 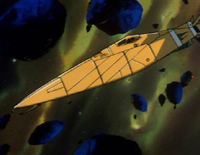 When the Outlaw Star faced the El Dorado, its crew was unaware of this information and believed that the El Dorado was extremely maneuverable. Gene Starwind and the crew of the Outlaw Star destroyed one of the El Dorado's, but at least one remains. Horus is one of Hilda's ships that is mainly used to transport her places, for good reason. The ship is nearly useless in combat, and does not even feature the grappler arms that are so common in other Outlaw and Pirate ships. However, it does have missiles and guns to defend itself, but because of Horus's size there is very little room to carry ammo. 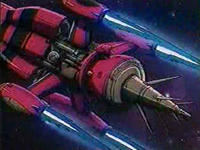 The ship was destroyed, along with its owner, when it was captured by the gravity of the nearby star, Farfala during a mission to recover the Outlaw Star. Obviously, nothing remains of the two. Hamyo's Ship belongs to Hanmyo, a member of the Anten Seven who also happens to be a child. The ship itself is one of a kind in its ability to separate into three separate grappler ships during combat. Very few pilots are skilled enough to go up against Hanmyo's piloting abilities, let alone face the wrath of two other ships (piloted by Kami and Nata, two super intelligent felines). 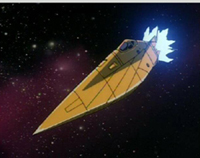 The ships use missiles as their main weapon, and in many cases these work to devastating effect. Prior to its run in with the Outlaw Star the ship(s) had never lost a battle, and everyone they had faced prior to that was killed. Unfortunately a clever strategy by Jim Hawking led to the demise of the ship(s) and its remains are currently floating in space, while the pilots are dead. An unnamed Kei Pirate Ship belonged to the Pirates who originally pursued Hilda. 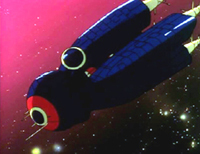 Similar to Hanmyo's ship it has the ability to split into two separate ships and use them in combat. 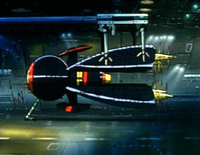 It had grappler arms and missiles, but was ultimately destroyed when it landed into Farfala, a star.